Jeremy Wilson Selected for NCBA Leadership Academy - Ward and Smith, P.A. Ward and Smith, P.A. 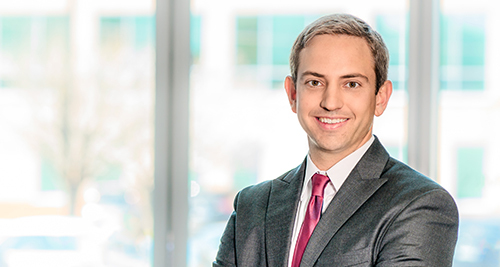 is pleased to announce that Jeremy Wilson was selected by the North Carolina Bar Association for participation in its 2017 Leadership Academy. This annual statewide program is capped at 16 participants, thus making admission competitive. Jeremy joins previous Leadership Academy graduates Lauren Arnette, Sam Franck, Will Oden, and Hayley Wells as representatives of Ward and Smith in this prestigious program. Jeremy practices a broad range of civil litigation before state and federal courts. He is a member of the Personal Injury and Wrongful Death Practice Group, where he has extensive experience litigating claims for wrongful death and serious personal injury. His practice experience includes cases involving vehicle accidents, professional malpractice, premises liability, products liability, and class actions, among other areas. In addition to his personal injury matters, Jeremy frequently represents clients in trusts and estates litigation and eminent domain cases. He also has significant business litigation experience, having represented numerous entities (from small area businesses, to financial institutions, to large corporations) in matters including contract and intellectual property disputes.